In my previous post, I mentioned that it was not so obvious (both from a physical as well as from a mathematical point of view) to write the wavefunction for electron orbitals – which we denoted as ψ(x, t), i.e. a function of two variables (or four: one time coordinate and three space coordinates) – as the product of two other functions in one variable only. ψ(x, t) is a complex-valued function of two (real) variables: x and t. Or four, I should say, because x = (x, y, z) – but it’s probably easier to think of x as one vector variable – a vector-valued argument, so to speak. And then t is, of course, just a scalar variable. So… Well… A function of two variables: the position in space (x), and time (t). In contrast, ψ(x) is a real-valued function of one (vector) variable only: x, so that’s the position in space only. Now you should cry foul, of course: ψ(x) is not necessarily real-valued. It may be complex-valued. You’re right. You know the formula: Note the derivation of this formula involved a switch from Cartesian to polar coordinates here, so from x = (x, y, z) to r = (r, θ, φ), and that the function is also a function of the two quantum numbers l and m now, i.e. the orbital angular momentum (l) and its z-component (m) respectively. In my previous post(s), I gave you the formulas for Yl,m(θ, φ) and Fl,m(r) respectively. Fl,m(r) was a real-valued function alright, but the Yl,m(θ, φ) had that ei·m·φ factor in it. So… Yes. You’re right: the Yl,m(θ, φ) function is real-valued if – and only if – m = 0, in which case ei·m·φ = 1. Let me copy the table from Feynman’s treatment of the topic once again: The Plm(cosθ) functions are the so-called (associated) Legendre polynomials, and the formula for these functions is rather horrible: Don’t worry about it too much: just note the Plm(cosθ) is a real-valued function. The point is the following:the ψ(x, t) is a complex-valued function because – and only because – we multiply a real-valued envelope function – which depends on position only – with e−i·(E/ħ)·t·ei·m·φ = e−i·[(E/ħ)·t − m·φ]. As mentioned in my previous post, the ei·m·φ factor just gives us phase shift: just a re-set of our zero point for measuring time, so to speak, and the whole e−i·[(E/ħ)·t − m·φ] factor just disappears when we’re calculating probabilities. The envelope function gives us the basic amplitude – in the classical sense of the word: the maximum displacement from the zero value. And so it’s that e−i·[(E/ħ)·t − m·φ] that ensures the whole expression somehow captures the energy of the oscillation. Likewise, the plane containing both the x– and the y-axis is a symmetry plane as well. A definite energy state of a hydrogen atom (or of an electron orbiting around some nucleus, I should say) appears to us as some beautifully shaped orbital – an envelope function in three dimensions, really – which has the z-axis – i.e. the vertical axis – as a symmetry line and the xy-plane as a symmetry plane. The e−i·[(E/ħ)·t − m·φ] factor gives us the oscillation within the envelope function. As such, it’s this factor that, somehow, captures the energy of the oscillation. It’s worth thinking about this. Look at the geometry of the situation again – as depicted below. We’re looking at the situation along the x-axis, in the direction of the origin, which is the nucleus of our atom. The ei·m·φ factor just gives us phase shift: just a re-set of our zero point for measuring time, so to speak. Interesting, weird – but probably less relevant than the e−i·[(E/ħ)·t factor, which gives us the two-dimensional oscillation that captures the energy of the state. Now, the obvious question is: the oscillation of what, exactly? I am not quite sure but – as I explained in my Deep Blue page – the real and imaginary part of our wavefunction are really like the electric and magnetic field vector of an oscillating electromagnetic field (think of electromagnetic radiation – if that makes it easier). Hence, just like the electric and magnetic field vector represent some rapidly changing force on a unit charge, the real and imaginary part of our wavefunction must also represent some rapidly changing force on… Well… I am not quite sure on what though. The unit charge is usually defined as the charge of a proton – rather than an electron – but then forces act on some mass, right? And the mass of a proton is hugely different from the mass of an electron. The same electric (or magnetic) force will, therefore, give a hugely different acceleration to both. So… Well… My guts instinct tells me the real and imaginary part of our wavefunction just represent, somehow, a rapidly changing force on some unit of mass, but then I am not sure how to define that unit right now (it’s probably not the kilogram!). Post scriptum: You should do some thinking on whether or not these m = ±1, ±2,…, ±l orbitals are really different. As I mentioned above, a phase difference is just what it is: a re-set of the t = 0 point. Nothing more, nothing less. So… Well… As far as I am concerned, that’s not a real difference, is it? 🙂 As with other stuff, I’ll let you think about this for yourself. Let’s first think about the wavefunction itself. It’s tempting to think it actually is the particle, somehow. But it isn’t. So what is it then? Well… Nobody knows. In my previous post, I said I like to think it travels with the particle, but then doesn’t make much sense either. It’s like a fundamental property of the particle. Like the color of an apple. But where is that color? In the apple, in the light it reflects, in the retina of our eye, or is it in our brain? If you know a thing or two about how perception actually works, you’ll tend to agree the quality of color is not in the apple. When everything is said and done, the wavefunction is a mental construct: when learning physics, we start to think of a particle as a wavefunction, but they are two separate things: the particle is reality, the wavefunction is imaginary. Quantum physics assumes there’s always some randomness in Nature and, hence, we can measure probabilities only. We’ve got randomness in classical mechanics too, but this is different. This is an assumption about how Nature works: we don’t really know what’s happening. We don’t know the internal wheels and gears, so to speak, or the ‘hidden variables’, as one interpretation of quantum mechanics would say. In fact, the most commonly accepted interpretation of quantum mechanics says there are no ‘hidden variables’. Adding or subtracting two terms in math, (E/ħ)·t − (p/ħ)∙x, implies the two terms should have the same dimension: we can only add apples to apples, and oranges to oranges. We shouldn’t mix them. Now, the (E/ħ)·t and (p/ħ)·x terms are actually dimensionless: they are pure numbers. So that’s even better. Just check it: energy is expressed in newton·meter (energy, or work, is force over distance, remember?) or electronvolts (1 eV = 1.6×10−19 J = 1.6×10−19 N·m); Planck’s constant, as the quantum of action, is expressed in J·s or eV·s; and the unit of (linear) momentum is 1 N·s = 1 kg·m/s = 1 N·s. E/ħ gives a number expressed per second, and p/ħ a number expressed per meter. Therefore, multiplying E/ħ and p/ħ by t and x respectively gives us a dimensionless number indeed. It’s also an invariant number, which means we’ll always get the same value for it, regardless of our frame of reference. As mentioned above, that’s because the four-vector product pμxμ = E·t − p∙x is invariant: it doesn’t change when analyzing a phenomenon in one reference frame (e.g. our inertial reference frame) or another (i.e. in a moving frame). It’s not only time and space that are related, as evidenced by the fact that t − x itself is an invariant four-vector, E and p are related too, of course! They are related through the classical velocity of the particle that we’re looking at: E/p = c2/v and, therefore, we can write: E·β = p·c, with β = v/c, i.e. the relative velocity of our particle, as measured as a ratio of the speed of light. Now, I should add that the t − x four-vector is invariant only if we measure time and space in equivalent units. Otherwise, we have to write c·t − x. If we do that, so our unit of distance becomes c meter, rather than one meter, or our unit of time becomes the time that is needed for light to travel one meter, then c = 1, and the E·β = p·c becomes E·β = p, which we also write as β = p/E: the ratio of the energy and the momentum of our particle is its (relative) velocity. Alternatively, we could also look at p as some constant, as there is no variation in potential energy that will cause a change in momentum, and the related kinetic energy. We’d then divide by p and we’d get (E·t − p·x)/p = (E/p)·t − x) = t/β − x, which amounts to the same, as we can always re-scale by multiplying it with β, which would again yield the same t − β·x argument. This is a wonderful formula, but let me first answer your most likely question: why would we use a relative velocity?Well… Just think of it: when everything is said and done, the whole theory of relativity and, hence, the whole of physics, is based on one fundamental and experimentally verified fact: the speed of light is absolute. In whatever reference frame, we will always measure it as 299,792,458 m/s. That’s obvious, you’ll say, but it’s actually the weirdest thing ever if you start thinking about it, and it explains why those Lorentz transformations look so damn complicated. In any case, this fact legitimately establishes c as some kind of absolute measure against which all speeds can be measured. Therefore, it is only natural indeed to express a velocity as some number between 0 and 1. Now that amounts to expressing it as the β = v/c ratio. Let’s now go back to that Φ(φ) = a·e−iφ = a·e−i(t − β·x) wavefunction. Its temporal frequency ω is equal to one, and its spatial frequency k is equal to β = v/c. It couldn’t be simpler but, of course, we’ve got this remarkably simple result because we re-scaled the argument of our wavefunction using the energy and momentum itself as the scale factor. So, yes, we can re-write the wavefunction of our particle in a particular elegant and simple form using the only information that we have when looking at quantum-mechanical stuff: energy and momentum, because that’s what everything reduces to at that level. So… Well… We’ve pretty much explained what quantum physics is all about here. You just need to get used to that complex exponential: e−iφ = cos(−φ) + i·sin(−φ) = cos(φ) −i·sin(φ). It would have been nice if Nature would have given us a simple sine or cosine function. [Remember the sine and cosine function are actually the same, except for a phase difference of 90 degrees: sin(φ) = cos(π/2−φ) = cos(φ+π/2). So we can go always from one to the other by shifting the origin of our axis.] But… Well… As we’ve shown so many times already, a real-valued wavefunction doesn’t explain the interference we observe, be it interference of electrons or whatever other particles or, for that matter, the interference of electromagnetic waves itself, which, as you know, we also need to look at as a stream of photons , i.e. light quanta, rather than as some kind of infinitely flexible aether that’s undulating, like water or air. However, the analysis above does not include uncertainty. That’s as fundamental to quantum physics as de Broglie‘s equations, so let’s think about that now. Our information on the energy and the momentum of our particle will be incomplete: we’ll write E = E0 ± σE, and p = p0 ± σp. Huh? No ΔE or ΔE? Well… It’s the same, really, but I am a bit tired of using the Δ symbol, so I am using the σ symbol here, which denotes a standard deviation of some density function. It underlines the probabilistic, or statistical, nature of our approach. The simplest model is that of a two-state system, because it involves two energy levels only: E = E0 ± A, with A some constant. Large or small, it doesn’t matter. All is relative anyway. 🙂 We explained the basics of the two-state system using the example of an ammonia molecule, i.e. an NH3 molecule, so it consists on one nitrogen and three hydrogen atoms. We had two base states in this system: ‘up’ or ‘down’, which we denoted as base state | 1 〉 and base state | 2 〉 respectively. This ‘up’ and ‘down’ had nothing to do with the classical or quantum-mechanical notion of spin, which is related to the magnetic moment. No. It’s much simpler than that: the nitrogen atom could be either beneath or, else, above the plane of the hydrogens, as shown below, with ‘beneath’ and ‘above’ being defined in regard to the molecule’s direction of rotation around its axis of symmetry. If our molecule can be in two states only, and it starts off in one, then the probability that it will remain in that state will gradually decline, while the probability that it flips into the other state will gradually increase. That constant probability is annoying, because our nitrogen atom never ‘flips’, and we know it actually does, thereby overcoming a energy barrier: it’s a phenomenon that’s referred to as ‘tunneling’, and it’s real! The probabilities in that graph above are real! Also, if our wavefunction would represent some moving particle, it would imply that the probability to find it somewhere in space is the same all over space, which implies our particle is everywhere and nowhere at the same time, really. So, in quantum physics, this problem is solved by introducing uncertainty. Introducing some uncertainty about the energy, or about the momentum, is mathematically equivalent to saying that we’re actually looking at a composite wave, i.e. 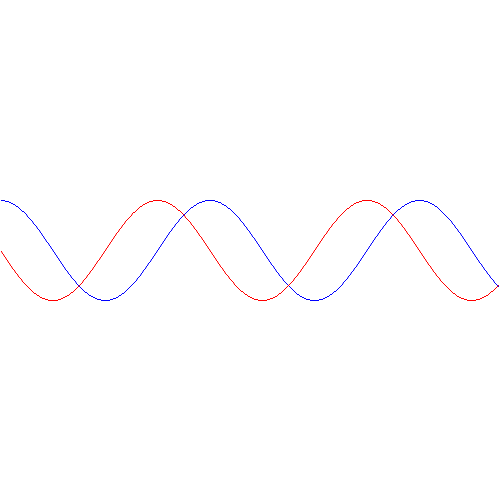 the sum of a finite or potentially infinite set of component waves. So we have the same ω = E/ħ and k = p/ħ relations, but we apply them to n energy levels, or to some continuous range of energy levels ΔE. It amounts to saying that our wave function doesn’t have a specific frequency: it now has n frequencies, or a range of frequencies Δω = ΔE/ħ. In our two-state system, n = 2, obviously! So we’ve two energy levels only and so our composite wave consists of two component waves only. Let’s now introduce uncertainty once again. The simplest situation is that we have two closely spaced energy levels. In theory, the difference between the two can be as small as ħ, so we’d write: E = E0 ± ħ/2. [Remember what I said about the ± A: it means the difference is 2A.] However, we can generalize this and write: E = E0 ± n·ħ/2, with n = 1, 2, 3,… This does not imply any greater uncertainty – we still have two states only – but just a larger difference between the two energy levels. This is valid for any value of t. What the expression says is that, from a mathematical point of view, introducing uncertainty about the energy is equivalent to introducing uncertainty about the wavefunction itself. It may be equal to a·e−i·[(E0/ħ)·t]·ei·(n/2)·t, but it may also be equal to a·e−i·[(E0/ħ)·t]·e−i·(n/2)·t. The phases of the e−i·t/2 and ei·t/2 factors are separated by a distance equal to t.
The thing is: you won’t get the Uncertainty Principle by staring at that formula above. It’s a bit more complicated. The idea is that we have some distribution of the observables, like energy and momentum, and that implies some distribution of the associated frequencies, i.e. ω for E, and k for p. The Wikipedia article on the Uncertainty Principle gives you a formal derivation of the Uncertainty Principle, using the so-called Kennard formulation of it. You can have a look, but it involves a lot of formalism—which is what I wanted to avoid here! I hope you get the idea though. It’s like statistics. First, we assume we know the population, and then we describe that population using all kinds of summary statistics. But then we reverse the situation: we don’t know the population but we do have sample information, which we also describe using all kinds of summary statistics. Then, based on what we find for the sample, we calculate the estimated statistics for the population itself, like the mean value and the standard deviation, to name the most important ones. So it’s a bit the same here, except that, in quantum mechanics, there may not be any real value underneath: the mean and the standard deviation represent something fuzzy, rather than something precise. Post scriptum: I know you expect something more from me, so… Well… Think about the following. If we have some uncertainty about the energy E, we’ll have some uncertainty about the momentum p according to that β = p/E. [By the way, please think about this relationship: it says, all other things being equal (such as the inertia, i.e. the mass, of our particle), that more energy will all go into more momentum. More specifically, note that ∂p/∂p = β according to this equation. In fact, if we include the mass of our particle, i.e. its inertia, as potential energy, then we might say that (1−β)·E is the potential energy of our particle, as opposed to its kinetic energy.] So let’s try to think about that. Let’s denote the uncertainty about the energy as ΔE. As should be obvious from the discussion above, it can be anything: it can mean two separate energy levels E = E0 ± A, or a potentially infinite set of values. However, even if the set is infinite, we know the various energy levels need to be separated by ħ, at least. So if the set is infinite, it’s going to be a countable infinite set, like the set of natural numbers, or the set of integers. But let’s stick to our example of two values E = E0 ± A only, with A = ħ so E + ΔE = E0 ± ħ and, therefore, ΔE = ± ħ. That implies Δp = Δ(β·E) = β·ΔE = ± β·ħ. But, because velocity is the ratio of distance over time, this introduces an uncertainty about time and distance. Indeed, if its velocity is β ± (β/m)·ħ, then, over some time T, it will travel some distance X = [β ± (β/m)·ħ]·T. Likewise, it we have some distance X, then our particle will need a time equal to T = X/[β ± (β/m)·ħ]. The thing is: you’ll have to read a bit more about Fourier transforms and why and how variables like time and energy, or position and momentum, are so-called conjugate variables. As you can see, energy and time, and position and momentum, are obviously linked through the E·t and p·x products in the E0·t − p·x sum. That says a lot, and it helps us to understand, in a more intuitive way, why the ΔE·Δt and Δp·Δx products should obey the relation they are obeying, i.e. the Uncertainty Principle, which we write as ΔE·Δt ≥ ħ/2 and Δp·Δx ≥ ħ/2. But so proving involves more than just staring at that Ψ(θ) = a·e−iθ = a·e−i·[(E/ħ)·t − (p/ħ)·x] relation. Having said, it helps to think about how that E·t − p·x sum works. For example, think about two particles, a and b, with different velocity and mass, but with the same momentum, so pa = pb ⇔ ma·va = ma·va ⇔ ma/vb = mb/va. The spatial frequency of the wavefunction would be the same for both but the temporal frequency would be different, because their energy incorporates the rest mass and, hence, because ma ≠ mb, we also know that Ea ≠ Eb. So… It all works out but, yes, I admit it’s all very strange, and it takes a long time and a lot of reflection to advance our understanding.